Few coins are as easily recognizable as the 1943 Lincoln Cent, struck at the Philadelphia, Denver and San Francisco Mints in the midst of the Second World War. Rather than the familiar copper which had been used for the United States one cent denomination since its introduction, these coins were struck in zinc plated steel. The new composition was utilized in order to save copper for the war effort and was selected after various experiments took place both at the Mint and by private companies. As early as July 1941 the Mint became aware of the growing shortage of copper due to America’s involvement in the War. With more than a billion cents struck at the three Mints that year, it was apparent that testing had to be done to find a suitable replacement for copper. Up to summer 1942 various forms of materials and forms of coins were proposed; among these were eccentric ideas such as paper coins (an idea soon abandoned as it was realized that the lifespan of coins made of paper was supposed to be very short) and coins with center holes (an idea actually proposed at various times in the 19th century but never introduced on regular coinage). When both the War department and the Bureau of the Mint could not come up with any reasonable ideas, external help was requested. In August 1942 the Mint sought contact with various companies located in the Eastern United States, including glass, Bakelite, plastic and even firearms firms. They were to create a suitable product which was durable and easy to produce at a reasonable cost. As no genuine Mint dies could be used, Chief Engraver John R. Sinnock designed a fantasy piece, which was based on the Columbian 2 Centavo piece. The obverse design was similar, although the lettering had been replaced with English texts, being “Liberty/Justice” on the obverse. The wreath on the reverse was based on a 19th century medal and had the text “United/States/Mint” at the center. Production tests started at the various companies, of which three had reported receiving Bronze test pieces from the Mint, for comparison purposes. Various materials are known to have survived up to the present day. These include various colors of plastic (now virtually all toned to brown) and Bakelite. All are extremely rare, but appear periodically at public auction and still sell at reasonable price levels. The most desirable of the test pieces are those which were struck at the Mint with official equipment. These include Bronze, Zinc and Zinc-Coated Steel pieces. It was the latter which was eventually selected, when both glass and plastic coins were abandoned due to various issues. According to Lewis the glass cents for production were to contain uranium oxide (the experimental pieces did not) as an anticounterfeing device; under ultraviolet light they would give of a fluorescent glow. But in 1942 the secret Manhattan project was begun, and the government could not afford to have uranium diverted away from the development of the atomic bomb. The plastic experiments came to naught when it developed that the only suitable plastics, urea and phenol had joined copper had joined copper and zinc on the list of critical materials. And thus, by the end of 1942, with the war not appearing to be ending soon the Mint settled on steel coins coated with zinc. The latter was to prevent rusting, which helped, but not to the full extent. During the year, production of the 1943 Steel Lincoln Cents took place at the Philadelphia (Mintage: 684,628,670), Denver (Mintage: 217,660,000) and San Francisco (Mintage:191,550,000) Mints. Various problems occurred once the coins reached circulation and the ever critical public. First of all, since the rims of the coins were not coated in zinc, the coins did rust even from contact with human sweat. Secondly, freshly minted Steel cents gave the impression to be dimes at first, which created confusion. And finally, vending machines with magnets caused the coins to stick. Not a very favorable situation in the middle of a crisis. With huge mintages, none of these coins are rare although high grade examples are scarce. Many Americans still find steel cents hidden away in drawers, and these pieces always attract some attention from non-numismatists, thanks to the unusual appearance of these pieces. Some are disappointed when they find out that average circulated examples are worth next to nothing, others, obviously are intrigued by their history and seek to find more. As such, these steel cents are fascinating conversation pieces, and perfect to teach others about history of the Second World War and its influence on American citizens. Because of the problems mentioned above, the composition was changed again in 1944, to a copper, tin & zinc composition, and the steel cent became a one-year type coin. While the ordinary 1943 Steel Cents are seldom worth big money, the rarely seen 1943 Bronze Cents always create a stir and command hefty prices when they are offered at public auction. Technically, these are error coins, created by mistakes at the various Mints, but they are listed in the major references as well. The errors occurred at all three producing mints when 1943 cent dies struck coins on bronze planchets which were leftover from the previous year. The circumstances under which the 1943 Bronze Cents were created are vague at best. Some say that they were created by Mint workers under suspicious circumstances, like many of the 19th century rarities that are not fully original; others say they are legitimate errors which miraculously escaped the quality control of the Mint in wartime. It is very interesting to note that virtually all examples of the error are well circulated. The finest known examples graded by PCGS are respectively MS-61RB (Philadelphia), MS-64BN (Denver) and AU-58BN (San Francisco). 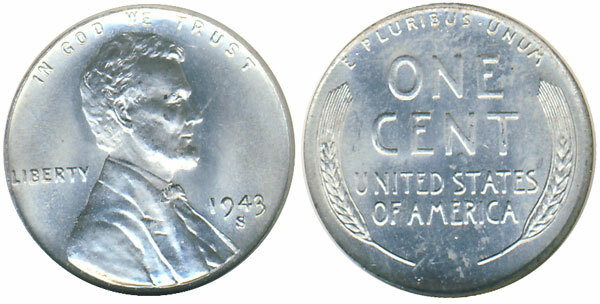 NGC has graded a single Mint State example of the 1943-S Bronze Cent as well. Offerings of these error coins are few and far between. Select recent auction results include $218,500 for a Philadelphia example graded AU-58BN by PCGS and $212,750 for a Denver example graded MS-64BN by PCGS. In 2012, the finest known San Francisco example graded PCGS MS62BN sold privately for $1 million. Needless to say, even a well circulated specimen attracts considerable attention, and sells for strong five figure prices at any major auction. When it comes to the regular 1943 Steel Cents, none are excessively rare, although finding a spot-free high grade example in a certified holder can prove to be difficult. The finest examples that are certified by PCGS and NGC, for all Mints, are graded as MS-68. Surprisingly, the 1943 Philadelphia issue, with the highest mintage, is the scarcest. PCGS has graded 48 1943 Steel Cents in MS-68, while NGC only has certified 5 at the same grade level. For the 1943-D, PCGS has graded 122 in MS-68, while NGC has graded 50. As for the 1943-S, PCGS has graded 52 in MS-68 with NGC having certified 13 in that grade. Lower grades, even MS-67’s are very abundant and affordable, for any of the 1943 Steel Cents. When it comes to values it must be mentioned that PCGS graded coins often sell for multiples of coins in NGC holders. This is because of PCGS set registry program and their allegedly stricter grading. That said, the current value for PCGS 1943 steel cents graded MS-68 is approximately $2500 each, while NGC graded examples appear to be selling for approximately $500 each, although offerings are rare, thanks to the low population. PCGS graded MS-68’s of the Denver issue sell for approximately $1500 each, with San Francisco coins usually selling for a bit more. NGC offerings are usually lower than that. It must be noted that prices vary widely, as these coins are often oxidized, and those examples trade for considerable lower amounts than spot-free steel cents.